Also, you will note you click export to excel on the ribbon from a list or library as soon you open the .iqy in excel it’s going to pass the List GUID along with the View GUID to _vti_bin/lists.asmx which due to authentication is going to fail and you will get stuck in an endless authentication loop. By this point you realize that Office 2013 / 2013 Client Integration with SharePoint Server 2016 does NOT work. If you open fiddler and capture the results of the session you will find that you’re getting a 403 and X-MSDAVEXT_Error: 917656; Access+denied.+Before+opening+files+in+this+location%2c+you+must+first+browse+to+the+web+site+and+select+the+option+to+login+automatically. 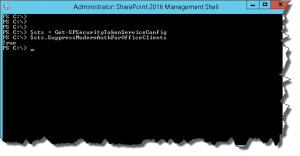 There is an obscure security update for SharePoint Server 2016: June 13, 2017 that will allow you to resolve this issue. However, it doesn’t mention the issue of FBA, Office 2013 or any of the issues listed above. But by running the following PowerShell cmdlets you will be able to use Office 2016 and 2013. However, it will break your ability to use the client integration with Office 2010. The last command should return True. On-Premise is dead, LONG LIVE ON-PREM!!! !